Musollah.com (founded and managed by Islamicevents.sg) has played an important role in collecting and organizing the data of the various musollahs made available throughout Singapore since 2007. 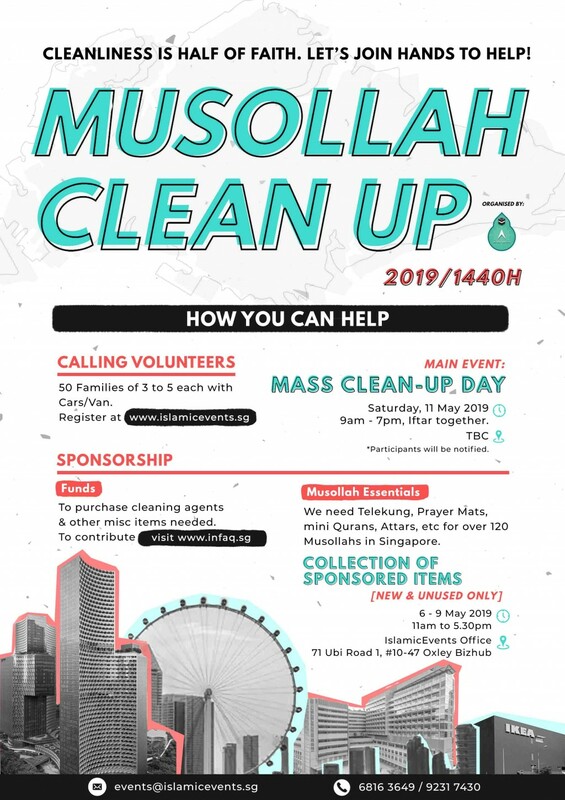 As part of our extended efforts in rallying the community together to care for these musollahs, in 2013 we launched a Mass Musollah clean-up nationwide to much success, alhamdulillah. We repeated the same effort in 2015 and 2017. This is our forth time running this event and we hope to achieve the same success insyaAllah. Contributions for this program will be channelled to purchasing necessary equipments and organising this activity. 3) Purchasing cleaning equipments like detergent, air fresheners, etc. 4) Printing of Musollah logo and qiblat direction. 5) Transportation of items. Van rental, petrol, diesel, coupons, etc. Sponsor in amounts of $10, $50, $100 or $1000.